We are enjoying these couple of days of WARM weather – it’s so nice to be able to go outside without a coat! 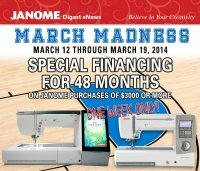 March Madness GE Capital – This March, Janome is offering a 48 Month Special Financing Rate on all Janome purchases of $3,000 or more! This special runs for one week only, so be sure to mark your calendar. Stop in soon to take advantage of this great offer! Electric Feather from Benartex has arrived in the shop. Be sure and stop by to check out these fabrics. Below is a sneak peek! Unity from Clothworks is in bright blues and lime green! Following are a few samples of this grouping. 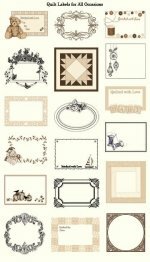 Stratford Park from Northcott is another wonderful collection in rich colors of blacks, browns, and creams and a great panel of labels. Take a peek! Piping Hot Curves shows you how to use accent curves in quilts with piping! Detailed instructions, illustrations and photos will teach you to make perfect piping, add it to curved designs and avoid curved piecing. Use the Piping Hot Curves technique and this book’s patterns or incorporate piping into your own curved designs with Susan’s tips for success. Book has 5 projects and an impressive gallery of inspiration! Sharynn’s Stitching Friends. The next meeting will be Saturday, April 19, 2014 at 9:00am. NOTE: We had to move it to the 3rd Saturday of the month for April. Be sure and bring Show and Tell. Beth Steiner is having regular Wednesday workshops from 3:30-5. These are designed for working on 4-H projects with Beth here to share her expertise and knowledge. The sessions will be held every Wednesday until fair-time. NOTE: The 4-Hers will NOT meet on Wednesday, March 26. Rose is once again holding classes that demonstrate how to use the different feet for our sewing machines. The January 23, 2014 class has been rescheduled for Thursday, March 20 from 1:30-3:00 pm. She will be showing us how to use the beading foot and she will also show us different ways to use a wing needle to enhance your sewing. Kansas Troubles BOM - The BOM will meet the second Tuesday of each month, for 6 months, starting March 11, 2014. Stop by the shop for more information. A sample of the quilt is on display. The finished quilt measures 64” x 64”. 7th Annual Southern Indiana Quilters’ Day Out brought to you by Sew ‘n’ Tell Quilt Guild. For more information, contact Carol Fridley 812-945-9507. Just a reminder – the first 250 passports sold will receive a 2014 charm and passport from the shop where your passport was purchased. If you haven’t purchased your passport yet, be sure and do so soon to ensure you get the 2014 charm! Receive another charm at each shop when your passport is stamped. Individual shop prizes will also be awarded. 10am – 6 pm Thurs.-Fri.
1 am – 5:30 pm Sat. Excitement, inspiration and fun for 3 full days! Sewing, Quilting and Embroidery plus shopping, workshops, trunk shows, make-it take-its, how-to demos, fashion events and quilt displays. SOUTHERN INDIANA SHOP HOP – June 18 – 21, 2014 – be sure and mark these dates on your calendar and reserve time to participate in this hop.